An effort to expand Google's Android office suite appeared almost a year ago -- but then something strange happened. I don't know if you've noticed, but Google announces an awful lot of stuff. So it's sometimes easy to see something new, get cautiously excited, and then kinda forget about it a few months later. We know many of you consider your mobile device as your primary tool to consume business information, but what if you could use it to get more work done, from anywhere? 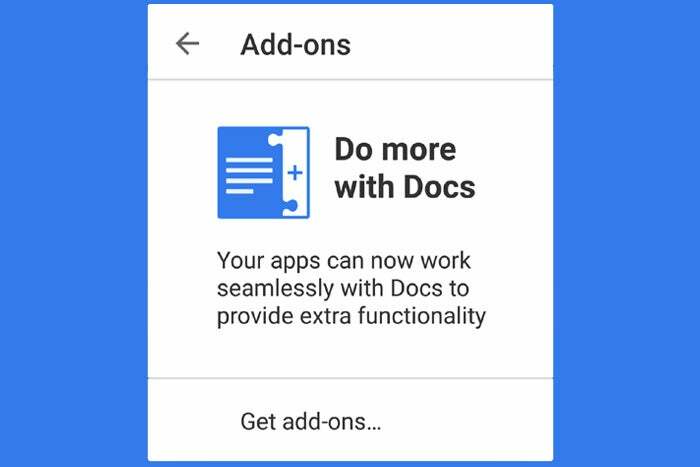 We’re excited to introduce Android add-ons for Docs and Sheets, a new way for you to do just that. 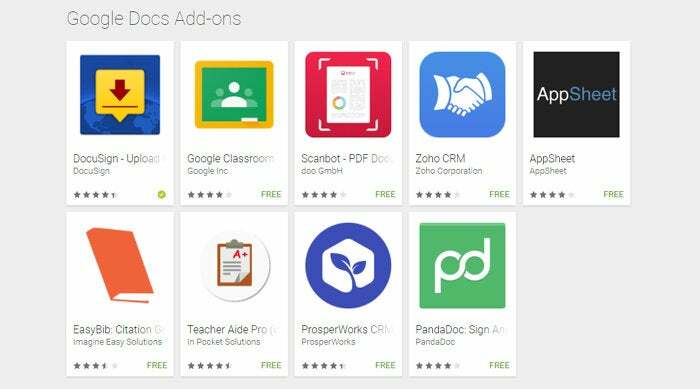 Whether it’s readying a contract you have for e-signature from your phone or pulling in CRM data on your tablet for some quick analysis while waiting for your morning coffee, Android add-ons can help you accomplish more. Pretty intriguing, right? As someone who uses Docs both on the desktop and from my mobile devices, this definitely caught my eye. Sure, Docs does enough to satisfy my mobile productivity needs as-is, but -- as you probably know by now -- I'm always looking for new and interesting ways to make my technology more useful and efficient. This seemed like something with a fair amount of potential. 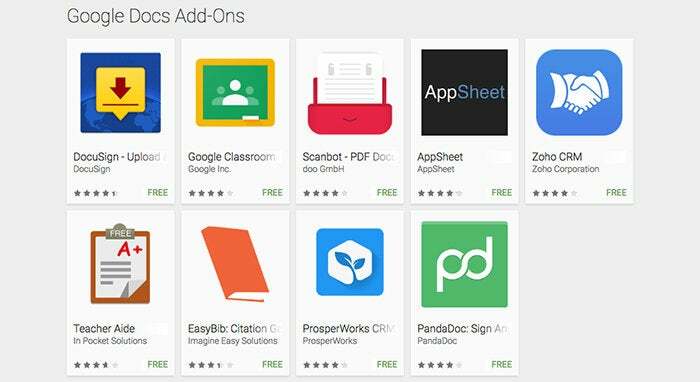 The launch announcement also included a call to developers to create and publish their own Docs and Sheets Android add-ons that could then appear in the dedicated Play Store section and be linked within the Docs app -- so clearly, this was a collection Google intended to expand. Huh. That lineup sure seems awfully familiar, doesn't it? Google's developers' site does note that add-ons for Docs and Sheets on Android are still in a "developer preview" status -- meaning Google reserves the right to change certain things about how the integration works as well as "the way in which this feature is distributed, discovered and used." Still, the site is actively encouraging developers to create their own add-ons -- most sensibly by modifying an existing standalone app to support the integration as opposed to creating a separate app solely for this purpose. All developers have to do, according to the published guidelines, is implement the integration and then request a "style review." The review ensures all add-on apps are "designed well, [follow] the UX Style Guide, and [do] not include or produce any spam, malware, or unacceptable content." Reviews can take "several days" to complete, according to the documentation. That all seems simple enough. So how is it that a year later, not a single new add-on beyond the small initial launch-set has appeared? There's certainly no shortage of opportunity. On the desktop front, Docs and Sheets boast dozens upon dozens of useful add-on options -- everything from chart-making tools to a variety of advanced formatting and content creation utilities. If nothing else, it only seems logical for some of those same add-ons to become available on Android. Heck, even some of Google's own self-made desktop add-ons -- like a tool that brings Google Translate functionality into the Docs editing interface -- haven't made their way over to mobile. All considered, one of two conclusions seems likely: Either Google for some reason hasn't approved a single app in the months since its Docs Android add-ons program debuted, despite developers' efforts to be included -- or not a single developer beyond the initial eight launch partners has attempted to add Android Docs integration into an app. Both possibilities seem rather odd, to say the least. I've reached out to Google as well as to several top developers of desktop-based Docs add-ons to see if anyone can shed any light onto what's happening. I'll update this page if/when I receive any additional information. UPDATE [6/28/17]: In a slightly puzzling twist, a Google spokesperson told me via email that the program is "still alive and well" -- but then went on to provide information about a different program to bring add-ons into Gmail for enterprise-grade G Suite users. (That program, notably, allows developers to create a single add-on that works across desktop and mobile platforms -- a distinction I can't help but think seems potentially relevant here.) The spokesperson also noted that Google is "planning to announce more add-ons functionality in the near future to extend the value of G Suite via apps" but said nothing directly about the actual Android-based Docs add-ons effort. I asked for clarification about the status of the Android Docs add-ons program -- whether we should expect to see more titles in that specific field at any point in the foreseeable future and why no such add-ons have appeared in the months since the program's debut. That was early Tuesday afternoon; as of Wednesday morning, I've yet to hear anything back. Meanwhile, I've heard from a few different developers of popular desktop-based Docs add-ons, and all have said essentially the same thing: They created those add-ons a long time ago, don't see them as a significant focus anymore, and have no plans to create new specific add-ons for Docs on Android. One developer noted that her company's focus had shifted to supporting a single app for the G Suite Marketplace -- something that seems very much in line with Google's vague remarks about "extend[ing] the value of G Suite via apps." So all in all, still no clear answers -- but connecting the apparent dots certainly provides some probable insight into why progress on Android Docs add-ons, specifically, seems to have stalled and why the list of available options is still stagnant nearly a year after the program's debut.